The total capitalisation of the nine SEE bourses rose 3.6% in 2015 to 103.6 billion euro, slowing from a 6.1% growth in 2014. Three-fifths of the companies that made it into the ranking saw their market capitalisation increase in 2015, with the banking sector shining as a major gainer, while most oil and gas firms and telecom operators lost ground. Once again, the ranking of the biggest listed companies in Southeast Europe saw little change at the top, as the 10 largest regional blue chips for 2015 remained the same as in 2014, although with some reshuffling. The top three spots remained reserved for the oil and gas sector, but after three consecutive years on the top, Romania’s OMV Petrom ceded its leading position to Croatian peer INA, which weathered better the global oil price slump. While the Romanian company, majority owned by Austria’s OMV, recorded a nearly 30% drop in market capitalisation, INA, controlled by Hungary’s MOL and Croatia’s government, posted a much smaller 19% decline. Romanian natural gas producer Romgaz kept its third spot despite a fall of 24%, closely followed by Slovenian drug maker Krka, which boosted its market capitalisation by 9.4% and thus climbed one spot higher. The sharp drop in oil prices and heightened market volatility resulted in a net loss of 690 million lei (155 million euro) for OMV, its first negative result in 12 years, while INA reported a consolidated loss for the third year in a row, but managed to cut it by 25% from 2014 to 1.42 billion kuna (189 million euro) on the back of improved operating results. Both majors have promised to keep on reducing costs amid the continuing volatile low price environment, with INA focusing on internal optimisation, productivity increase, and retail restructuring, and OMV Petrom scaling back investments alongside strict cost discipline and cash management. The Croatian company slashed its staff numbers by 10% in 2015 to 11,256, while its bigger Romanian rival cut its workforce by 5.4% to 16,038. At the same time, the total hydrocarbon production of INA rose 6% last year to 40,900 barrels of oil equivalent (boe) per day, while that of OMV Petrom fell 1% to 178,600 boe. The remaining Top 10 positions were taken up by three Romanian and as many Croatian entrants, including four banks. In the wider top 100 ranking, Croatia had a clear dominance with 27 companies, as many as in 2014, trailed by Romania with 20 (20 in 2014), Bulgaria with 17 (15 in 2014), Slovenia with 11 (20 in 2012), Bosnia with eight (10 in 2014), Macedonia with five (four in 2014), and Montenegro with four (three in 2014). At the same time, the biggest bourse in the region remained the Romanian one, BVB, with a market capitalisation of 32.3 billion euro at end-2015, followed by the Zagreb Stock Exchange (ZSE) with 27.4 billion euro and the Ljubljana bourse (LJSE) with 24.2 billion euro. The other six stock markets in SEE remained well behind the leaders, with Belgrade at the fourth spot with a capitalisation of only 5.6 billion euro, equal to less than a fifth that of BVB, trailed by Sofia with 4.4 billion euro. Among the best individual performers in the rankings, Crnogorska Komercijalna Banka, a subsidiary of Hungary’s OTP, shines as the most successful newcomer at the 13th spot. It is also the best placed Montenegrin entrant, accounting for more than a quarter of the local bourse’s market capitalisation. Also, Bosnia’s UniCredit Bank outperformed the pack with a jump to the 24th position from 77th, following a more than fourfold rise in market capitalisation. On the opposite side, Bulgarian fuel trader Petrol recorded the biggest loss – of 46 places to 95th position with a 54% drop in capitalisation. The total number of newcomers to the 2015 ranking was 11, down from 16 a year earlier, as the entry threshold climbed 8% to 86 million euro. Low liquidity and fragmented stock markets have long been a major hurdle to attracting bigger capital inflows to the region, but there is light at the end of the tunnel. At end-March 2016, SEE Link, a regional platform for trading of securities listed on equity markets in SEE, was launched. It was initiated in 2014 by Bulgaria, Macedonia and Croatia, with the help of the European Bank for Reconstruction and Development (EBRD), aiming to improve accessibility and visibility of securities and thus boost liquidity. Presently, only Bulgarian, Macedonian and Croatian listed companies trade via the platform, but the bourses of Belgrade, Ljubljana, and Banja Luka are expected to join it soon, following the completion of certain technicalities. The Montenegro Stock Exchange (MNSE) and the Athens Stock Exchange – the biggest one in the region – have also agreed to join the project. As of April 1, 2016, SEE Link started calculating two 10-share blue chip indices – SEELinX and SEELinX EWI – with a base level of 100 points. SEE LinX is a market capitalisation weighted index adjusted for the free-float of each constituent, while SEE LinX EWI is an equally weighted index with the same constituents. By September 15, SEELinX gained 10.4% to 110.01 points, while SEELinX EWI added 7.7% to 107.55. Despite a slow start, SEE Link is expected to gather momentum and draw investment funds’ interest in the coming months. However, it should be supported by the listing of more liquid, higher quality companies on the regional bourses, as well as by better regulations, many analysts believe. 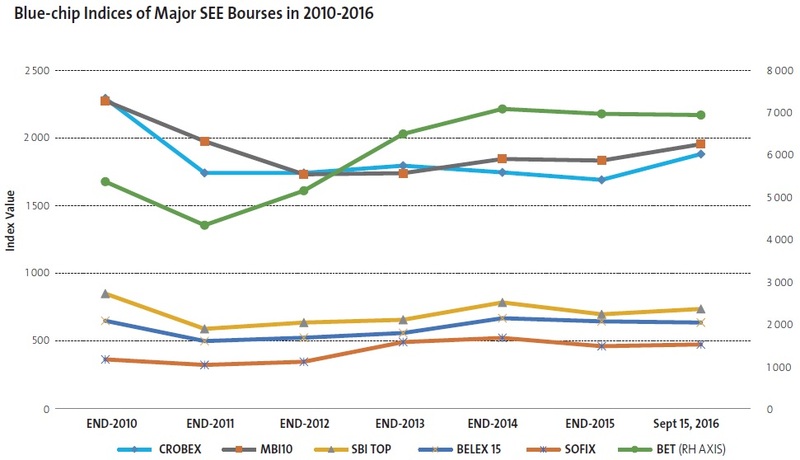 Looking at the regional stock market performance, measured by the major bourses’ blue chip indices, we see an overall declining trend in 2015, which was most obvious in Bulgaria and Slovenia, with the SOFIX and SBI TOP losing 11.7% and 11.2%, respectively during the year. Macedonia’s MBI10 was the best performer, losing only 0.6%, despite the protracted deep political crisis in the country. In the first nine months of 2016, however, most major indices gained ground, with Croatia’s CROBEX leading the pack with an 11.3% rise by September 15. It was backed by tourism and industry companies and weathered heightened domestic political instability as the country called an early general election less than a year after the previous one. According to local analysts, the outcome of the snap vote on September 11, in which conservative HDZ party fell short of an outright majority, will likely have no dramatic impact on the financial market. Yet, the formation of a stable government is seen as a prerequisite for the good performance of the domestic economy and hence local companies and the stock market. The second best performer this year has been the MBI10 with a 6.5% gain till mid-September, confirming the tendency that political turmoil has little impact on stock market performance in SEE. Macedonia, which has been mired in an almost two-year political deadlock, missed two scheduled election dates in 2016 – in April and in June – and scheduled another one for December 11. At no. 3 and 4 in the list of growing stock markets came Slovenia and Bulgaria, which erased partly their 2015 losses, climbing 5.8% and 2.9%, respectively. On the opposite end of the table, Serbia and Romania extended their declines, with Belgrade’s BELEX shedding 1.4% by mid-September on top of a 3.4% fall in 2015, and BVB’s PET edging down 0.4%, following a 1.6% decline last year. Romania’s stock market started 2016 with a large decline in line with the rest of the international equity markets, which were heavily drawn down by fears regarding China’s economy slowing that put investors’ nerves to test. Then, in the next two months, the local market recovered some of the losses, especially due to some companies surprising investors with dividends. In January, the Bucharest Stock Exchange (BVB) lost more than 10% in value, marking the weakest debut year from 2011, but investor mood improved afterwards and in February and March the markets returned to growth, helping the bourse post a loss of about 4 % for the first quarter. This development placed Romania as one of the biggest losers in the region, while the Budapest and Warsaw stock exchanges had yields of 7.5%. Developments on the BVB were related more to those on the stock markets in Western Europe, mainly Germany, and the U.S., rather than to the evolution of exchanges in Central and Eastern Europe. However, most Western stock markets have already recovered the losses caused by the 2008 financial crisis with major stock indices reaching values above the 2007 highs, while BVB’s benchmark index BET should rise by about a third to reach the 10,000 points threshold, where it was in 2007. In the second quarter, BVB indices fluctuated, but in general continued to fall. BET, which tracks the 10 most liquid listed companies, closed the first half at 6,487 points, down 7.4% compared to the beginning of the year, marking the third first-half stock market decline over the last 20 years. But in 2016, there is one key difference – Romania has a better economic growth than most other European Union countries and the decline did not come after a rally. Among the factors that pushed down the BVB are pessimism related to China’s economic slowdown, the drop in oil prices, which hit record lows in February, fears that the U.S. Federal Reserve would embark on a more aggressive rate hike policy, and most recently, the UK referendum result that put Britain on a path to exit the EU. However, in the past two months, BET managed to recover strongly, reaching levels from the start of the year, but still far from the 2007 highs. I have no great expectations for the rest of the year on new listings or liquidity, since it is an election year and the politicians, who should contribute to promoting the Romanian capital market in the category of more developed markets globally, towards the Emerging market status*, will have other concerns. *editor’s note: In March, FTSE Russell, one of the most important international institutions, which analyses global capital markets, supported by the opinions of international experts and investors, certified that Romania’s stock market meets all but one of the nine criteria required to be classified as Emerging market, with the exception being the liquidity criterion. Trading on the Zagreb Stock Exchange (ZSE) this year was marked by the general recovery of stock indices, with a continued negative trend of liquidity. ZSE’s wider blue chip index, CROBEX, rose 5% in the first seven months, while the CROBEXtr market capitalisation weighted total return index gained some 7%. It seems that positive macroeconomic developments, with Croatia emerging from a sixyear recession in 2015, transferred part of the optimism onto the capital market. Tourism remained in the focus of investors. In the past few years, despite the prolonged recession, tourism recorded growth in arrivals and overnight stays, as well as a rapid rise in stock prices. Once again, this year’s geopolitical events and the difficulties encountered by Croatia’s main competitors in the Mediterranean shifted investor focus to that sector. The tourism sector index has gained almost 14% this year, after a cumulative jump of more than three times in the last three years. One of the major winners, Valamar Riviera, was the only of the 10 most liquid stocks that recorded an increase in turnover. This year, tourism was joined by the industry sector, which, underpinned by exporters, posted a growth of 11.5% year-to-date. In tourism, mergers and acquisitions continued this year, with PPHE Hotel Group fully acquiring Arenaturist and a number of privatisations, including the tenders for state shares in hotel operators Imperial, Suncani Hvar, Korcula and HTP Hotel Maestral, of which the first three were successfully completed, while the last attracted no bidders. Although Croatia took eight companies out of its ‘strategic list’ in May with the intention of privatising them, the collapse of the government in June resulted in the sale only of a 20.5% stake in Koncar Elektroindustrija through a block transaction on the ZSE. Those transactions, valued at some 50 million euro, slightly improved ZSE’s liquidity, while at the same time regular stock turnover entered its ninth consecutive year of decline. Bourse turnover was dominated by the food, travel, and telecom sectors, which together with holding company Adris make up nearly 70% of the turnover. Regular stock turnover on the bourse in the first seven months of 2016 was about 30% lower year-on-year, while at the same time there was an increase in block transactions and on the OTC market. Block turnover was only 15% lower than regular turnover this year, a result of poor regular turnover and a growth in block transactions, primarily in Koncar, Ledo and Hrvatski Telekom, which were quite active in block trading. The lack of new issues on the stock market is one of the reasons for the low liquidity in regular trading, while on the demand side, the number and structure of investors is to blame. An increasingly smaller number of major players have a growing importance on the market. Among them are the main domestic pension funds, which have longer investment horizon and shareholding period. From 2009 to 2016, their domestic equity investments rose 3%, reaching 7.5% of the total stock market capitalisation. However, if we look at the free shares in circulation, this proportion is as high as 30%. On the supply side, after a seven-year pause in initial public offerings (IPOs), agricultural company Granolio made a successful placement of new shares and listed on the bourse in late 2014, followed by shipping company Tankerska Next Generation in early 2015. However, bigger listings, like for example HEP, Agrokor or Hrvatske Autoceste (HAC), are still absent. These trends led to a concentration of trading in the most liquid stocks, so the 10 most traded issues this year made up almost 70% of total turnover, compared to 60% last year. Further developments on the stock market will largely depend on the sustainability of macroeconomic growth, while the revival of stock turnover requires new issues, public offerings and privatisations to boost the number of shares in circulation. Also, if the pace of mergers and acquisitions intensifies, it might push individual stocks to the forefront, and thereby contribute to the boost of the overall stock market liquidity. So far, till mid-August 2016, the main Ljubljana Stock Exchange (LJSE) index SBITOP hasn’t moved much as it is up by a meagre 2.8%. However, it should be noted that most companies included in the index paid out a very generous dividend yield, on average standing at roughly 4.7% gross for the index. Therefore, the total return should be quite satisfactory for investors in Slovenia. Hefty dividends were also one of the key catalysts that moved the market in spring months, only to be adjusted after ex-dividend dates. Another catalyst was the rumour, regarding Gorenje acquisition by Panasonic. Consequently, Gorenje is so far a star of LJSE with its price up by more than 55% year-to-date. Note that Panasonic owns 10.7% of Gorenje and that Gorenje announced Panasonic will perform a due diligence of Gorenje Group till end-September with no decision yet made regarding any transaction. Any pending decision from Panasonic will therefore influence Gorenje share price severely in the autumn and consequently also influence the mood on LJSE in the following months. Presently, Gorenje trades at 6.7 times EBITDA with trailing earnings still being negative, while management strategic goals remain ambitious. Otherwise the biggest year-to-date increase in LJSE prime market was recorded by logistic provider Intereuropa, with its share price up 75%. While divestment of majority stake by a bank consortium faltered, better results probably contributed to an improved sentiment. Significantly trailing Gorenje’s second place was insurance group Sava Re, where again sentiment is slightly driven by takeover speculations. Namely, Adris Group has been raising its stake in the insurer, while a regulatory approval for boosting stake to 30% is still awaited. On the other side of the spectrum, port operator Luka Koper recorded a stagnation of its share price year-to-date while pharmaceutical company Krka experienced a 10% drop. Luka Koper reported excellent results and throughput growth, so the main culprit could be a small free float or corporate governance issues that were quite evident in June, when a labour strike hampered operations for several days. Krka, on the other hand, reported results mostly in line with analyst expectations; however these were burdened by currency weaknesses in Russia and price erosions in Western Europe. Note Krka now trades at 6x EBITDA while Luka Koper at 5x. We believe the rest of 2016 will depend much on how the above mentioned takeover speculations materialise. Also any change in state asset strategy, which would move a company more toward portfolio classification, could be beneficial to the overall market sentiment. In the absence of this, a continuation of stagnation is envisioned, as earnings growth projections are positive but far from spectacular. It’s true however that spring 2017 should again bring a more positive dynamics, as the 2016 dividend levels are likely to repeat in 2017 as well, delivering a very generous dividend yield. A major story could be a listing and privatisation of the biggest Slovenian bank, NLB, albeit news about this process are still vague. Disclaimer: The author of this article is owner of Petrol and Krka shares. ALTA Invest and related entities can be owners of mentioned shares. 2016 will prove particularly difficult for the Belgrade Stock Exchange (BSE). Not only has liquidity not improved, but some of the previously most traded stocks will be delisted after takeovers and squeeze-outs. The regular trading value (excluding arranged block transactions) halved in January-September as compared to the same period of 2015 and the liquidity weakness has even caused the main benchmark BELEX15 to shed two more components in 2016, with one more expected to leave the index by the end of the year. Consequently, the muted trading has smoothed the index’s movements, bringing its performance slightly above the major regional benchmarks, but far below emerging markets. So, historical events such as Brexit are barely visible on the BELEX15 12-month chart. However, the valuations for many listed companies remain very inviting. Let us look at the positive developments. The new general manager of the BSE has managed to include the state-issued fixed income securities in the Prime Listing, bringing some fresh volume to the market. This move was also significant as investors have been given an indicator of the yield curve, with maturities ranging from two to 10 years, both in dinars and in euro. In today’s world of positive yield scarcity, Serbian bills and bonds are very attractive to both institutional and individual investors. Furthermore, the BSE management has initiated education of attractive big local companies that are in private ownership, informing them about all the benefits of IPO launching and (dual) listing(s). Some of these companies have expressed interest in raising capital this way, so it is fair to say that 2017 might bring the first IPO on the Serbian market. If that happens, many others would follow, and that would be a significant boost to the BSE. Favorable winds are also coming from the macroeconomic side, as plenty of the indicators point to restored real growth of over 2%, excellent fiscal performance, revived domestic consumption and solid export performance. Serbia remains on the EU path and some major milestones in membership negotiations were reached. The credit rating of the country is stable and with the current dynamics a positive revision might be expected in the foreseeable future. However, the main challenges remain in the form of necessary reforms, particularly in the domains of SOE, legal framework and public administration rightsizing. The most recent reviews of Serbia’s economic performance under the ongoing standby arrangement with the IMF reveal many details on reforms and the restructuring of the SOEs, as well as potential models of privatisation for banks and major companies. Bringing those companies to the bourse after their transformation would erase the BSE’s major disadvantage – its lack of blue chips with large capitalisations (and free floats). Telecoms provider Telekom Srbija, power utility EPS, postal and railway operators, etc., would attract even the biggest players from the asset management industry, bringing new life to the BSE. The Bulgarian stock market has been among the worst performers in the past years, with the blue chip SOFIX index still standing around 75% below its pre-crisis peak. From this perspective it offers solid catch-up potential as at the same time other markets performed far better. Generally, the local market has almost no correlation with the developed ones. In the past weeks we have seen some positive signs as it finally managed to erase year-to-date losses. Compared even to the regional markets, the Bulgarian one is among the smallest ones and low liquidity is one of the most serious issues. While low liquidity may accelerate a negative movement, the market can also rise quickly as a consequence of poor – so, fast movements can be observed on markets like the Bulgarian one. Still, liquidity is an issue when it comes to allocation by foreign investors in the region as few companies from the local stock exchange can pass the liquidity filters of foreign institutional investors. From a fundamental perspective, the outlook for the Bulgarian market is relatively promising – the macroeconomic status of the economy is pretty solid – just like most of the regional economies, the Bulgarian one is faring quite well as domestic consumption is compensating the fairly milder external conditions – GDP was up by 3% year-on-year in the second quarter, which was much higher than the EU average – the same is actually valid for other economies in the region. Thus, many companies posted strong results for the first half of 2016, with valuation ratios suggesting significant upside. The average P/E for the market is below 8x (on a ttm basis) which is among the lowest not only in the region but also globally. Of course, liquidity is a strong impediment and that is the major reason why such levels of valuation ratios do not look too compelling for the big investors. Still, we believe that SOFIX will finish the year higher. In the next months we expect another IT company to debut on the local stock exchange – the size of the issue however is too small to attract serious interest from abroad, but it is expected to serve as a test for the capital market. If successful, the IPO may convince other companies to go public. However, the market needs really many more and bigger companies to become more attractive.